This Italian dish is so delicious. You can replace the fish with salmon, tuna, or even chicken if you are not a fish lover. Good health starts in the kitchen. From my kitchen to yours, bon appetit! Season both sides of fish with juice from half of the lemon, sea salt and freshly ground black pepper. Set aside. In a medium sized mixing bowl, add tomatoes, olives, and juice from other half of the lemon. Stir together and set aside. Preheat a large skillet over medium-high heat with the extra-virgin olive oil. Add the fish and cook for approximately 3 minutes on each side. 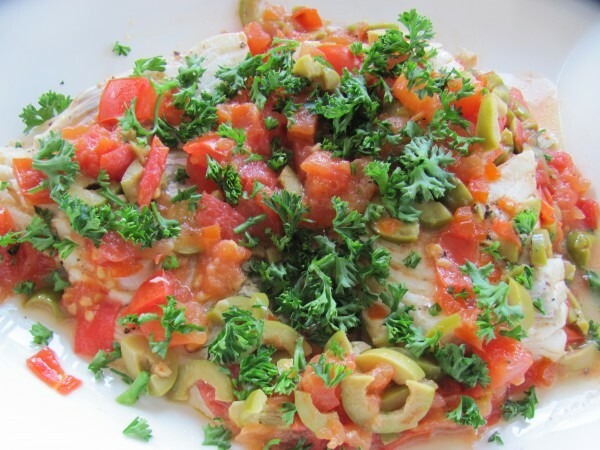 Top fish with tomato and olives mixture, reduce heat to low and let simmer for 10 minutes or until fish is cooked through. 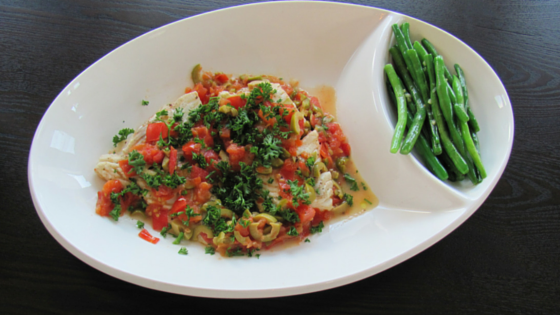 Place fish on serving plates and top with olive tomato sauce. I served it with green beans, gently sautéed with garlic and extra-virgin olive oil. You can also add Italian Fried Mushrooms or Italian Brussels Sprouts and make it a real Italian home cooked meal. Share this recipe with someone who loves a good home cooked Italian meal! ← Give Yourself A Happy Boost!